Once teams were cleared, they were allowed to integrate onto HASP. 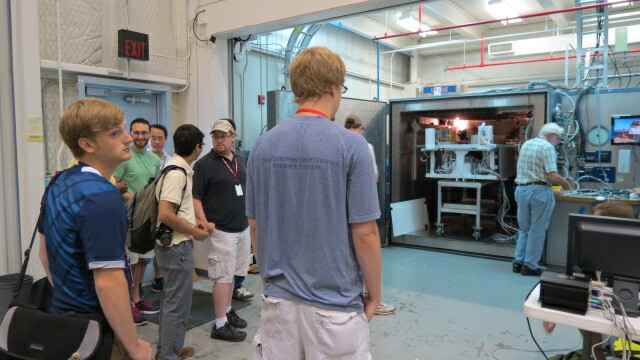 Ten of the 12 teams passed the check out and our currently in the thermal-vac chamber. The thermal-vac chamber allows for a full systems test under simulated stratospheric conditions. The total process should take about 5-6 hours. We should be done around 4 pm today. Data is being downlinked and we can monitor in near real time. In addition to individual payload data, we also monitor the HASP voltages, temperatures, and the ambient pressure. The best about integration week is that I get to spend some hands-on time with the payload. As the microbiology leg of the team, the payload has been in the very capable hands of the undergrads. They have designed, fabricated, and tested the payload extensively. I spend the majority of my time on the micro side. So this is the time when I get to attach the nuts and bolts, configure the electrical connections, and monitor the data. This week is essential for the successful operation of the payload during launch week. Speaking of the undergrads, their hard work has paid off. The payload is fully integrated to HASP (High Altitude Student Platform) and is ready for tomorrow’s thermal-vac test. The payloads will be challenged to a low temperature around -50C and a high temperature of 50C. The chamber will also pull a vacuum to mimic the conditions experienced at 125,000 ft. (38 km.). For a full list of participants and their experiments, go to http://laspace.lsu.edu/hasp/index.php.